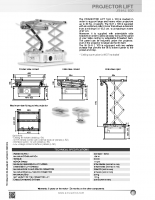 The PROJECTOR LIFT SI-H L 100 is studied in order to support large and heavy video projectors up to 30 Kg. of weight. The SI-H L 100 is supplied with an extremely silent motor that allows a descent from a minimum of 14 cm. to a maximum of 97 cm. Moreover it is supplied with extendable side brackets in order to allow an easy fixing of the panel of your false ceiling by adjustable threaded bars. 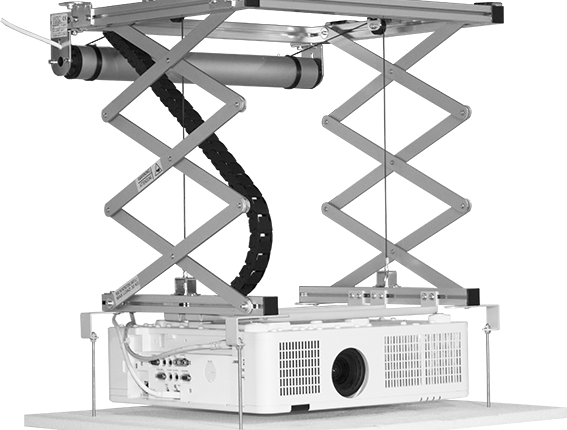 The panel can be mounted under the projector, even if the projector is larger as the lift itself. 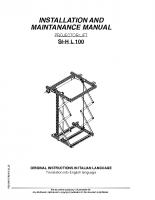 The lift SI-H 100 is equipped with two safety screws that prevent the lift to extent further to the preset end stop.